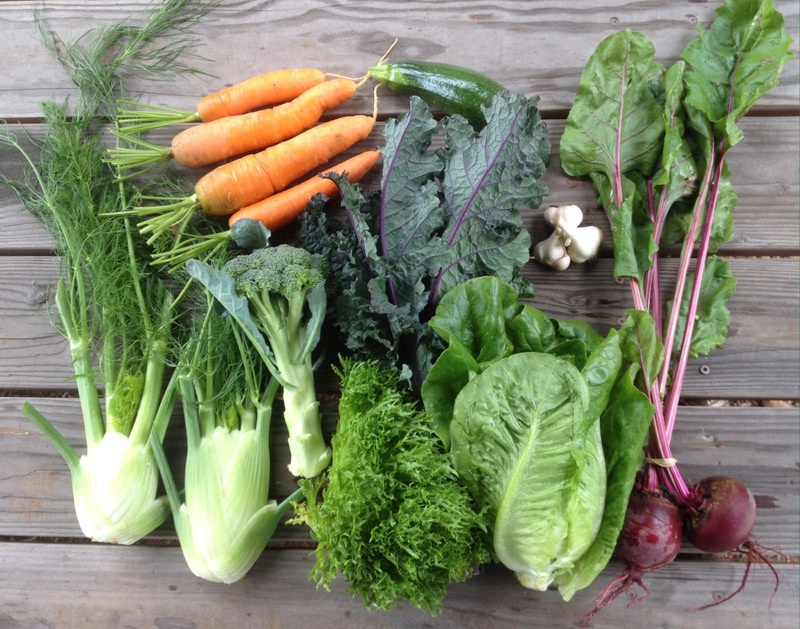 Fennel, carrots, 2 heads of lettuce, kale, zucchini, garlic, and beets. Monday shares also get broccoli today and Thursday shares last week had broccoli. When broccoli is ready you have to get it! It won’t wait around very long. I don’t grow much broccoli at all because it takes up so much space for the amount you get out of it, and I am space limited. But I wanted to try a little bit this year as a sampler. It turned out OK, not huge heads, but not horrible. The frilly lettuce is called “Reef” and is basically a lettuce version of frisee (a common element in mesclun mix). If you make one cut near the base of the head, all the leaves should come apart individually, leaving you with instant salad. The other lettuce is a romaine. We were ideally going to keep one of these varieties around for cutting next week, but they were both beginning to go past their harvestable stage, so we may not have lettuce next week. We found some huge carrots today! They are still tasting good, but we are going to keep giving them out every week so we can get through them before they get woody. The garlic heads of this variety are small, mostly due to the garlic rust which they got pretty bad on the leaves. They aren’t really worth storing for fall, being so small, so I thought I’d give them out first and let the larger heads (a different variety you’ll get later) keep curing for storage. For the fennel, try a shaved fennel salad with citrus. Or put it on the grill.